Mika has had a chronic dry and cracked nose pretty consistently the whole time we've had her. We worked with our awesome vet to find a solution to the problem, first trying glycerin as a moisturizer. It helped a little but didn't solve the problem. She did some more research and discovered that she likely has a breed related keratinization disorder. I'll include more information about that at the end of the post for those who are interested in knowing more. Our vet's recommended treatment was tacrolimus ointment, which is sometimes used to treat severe eczema in people. It was not exactly a cheap upfront cost, but a little goes a long way. We started with twice a day applications (we started treatment in late September) and have since backed off to once a day. I apply a thin layer to her nose using a q-tip and then hold onto her while it absorbs so that she doesn't lick it. We usually end with a play session, to continue to distract her from licking. Her nose has healed tremendously and is looking plumper and healthier now. Pretty drastic improvement, yeah? I don't have any more recent pictures than this one at the moment. But her nose is free of cracks and is no longer dry and she is breathing much easier. If you want more info about the dermatitis she has, you can read more after the jump. 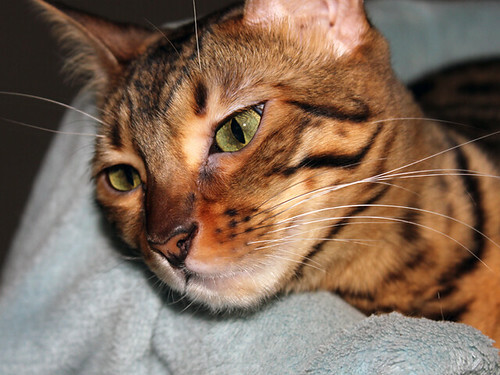 Article Abstract: Affected cats were three Bengals, one male and two females, whose age at onset of lesions ranged from 13- to 20-weeks old. Nasal planum scaling progressed to thick crusting, consequent exfoliation and exposure of underlying erosions. No signs of pruritus or pain were present but mild respiratory signs were noticed. In all cats, haematology and biochemistry were normal, they were FIV and FeLV negative, PCR for herpesvirus, calicivirus and Chlamydia were negative, and viral isolation for calicivirus and herpesvirus was negative. Wood's lamp examination was negative, as were bacterial and fungal cultures. Cytology showed exfoliating keratinocytes. A skin biopsy taken from one case showed no significant changes. Biopsies from the nasal planum of four dead cats with non dermatological conditions (controls) were collected for comparative studies. Morphometry to record the percentage of the granular layer (GL) and stratum corneum (SC) on the total thickness of the epidermis of the nasal planum was performed. The GL and SC accounted for 10.2 and 21.7% of the epidermal thickness in the affected cat, compared to 18.3 and 20.2%, respectively, in the controls. A significant reduction (P < 0.02) of the SC thickness was detected in the affected cat compared to controls. No treatment was instituted as all cats underwent complete (two cats) or nearly complete (one cat) resolution. The reported cases share the same breed, age at onset, type of lesions and a similar outcome. A reduction of the SC thickness in one of the affected cats was recorded. Therefore, an underlying congenital condition is suspected that manifests with high epidermal cell turnover and normal keratinization. Vet Dermatol. January 2004;15 Suppl 1(0):28. 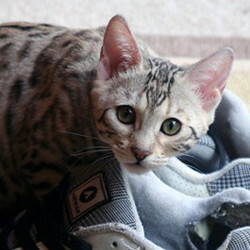 Article Abstract: The purpose of this report was to describe a unique dermatitis affecting Bengal cats in Sweden. 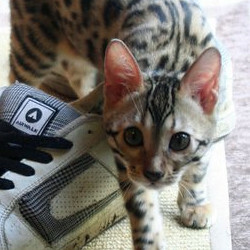 Forty-eight Bengal cats were presented to DjurAkuten between 1999 and 2003. Six cats (four males and two females) exhibited a unique dermatosis characterized by fissures, crusts, erosions and ulcers limited to the nasal planum. No other skin or internal lesions were noted, except for a heart murmur in one cat. The age of onset varied between 4 months and 1 year. The skin disease did not appear to be contagious. Fungal cultures were negative in four subjects, and haematology and serum chemistry results were unremarkable in two cats. In one patient, histopathology revealed marked epidermal parakeratosis and crusting, and a moderate mononuclear and neutrophilic dermatitis with periadnexal plasma cells. 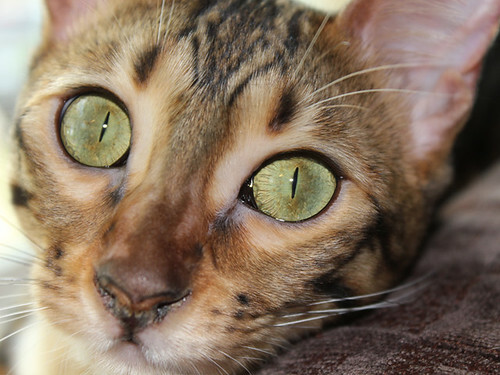 Five cats were treated with antibiotics without noticeable improvement in nasal lesions. Prednisolone administration resulted in complete remission in one cat and partial, short-term improvement of lesions in another. Topical application of salicylic acid improved lesions in one of two cats. Finally, tacrolimus ointment led to a rapid decrease in lesions in four patients. Follow-up varied between 4 months and 3 years. One cat remained in complete remission with prednisolone, partial improvement was maintained in one cat with salicylic acid, and marked improvement of lesions persisted with topical tacrolimus in four patients. The cause of this unique dermatitis remains elusive. The occurrence of skin lesions in one breed suggests a heritable cause. The response of lesions to immunomodulators suggests of an immune pathogenesis. Biopsy would be ideal for definitive diagnosis in your cat's case, but there is no harm in trying topical therapy as suggested in Dr. Bergvall's article. I found some more pictures of this phenomenon on this site (just scroll down when you get there). Note: The reason we started with the tacrolimus is because prednisolone can carry side effects since it is a systemic medication and the salicylic acid is essentially aspirin, which we wanted to avoid as well. And since it's helping so much, it seems to have been a good choice! UPDATE 09/29/2012: The tacro is still doing the job with our once-a-day applications and we're not even a third of the way through our tube of it after a year of treatment. Totally worth that upfront cost for how long it lasts. We find it's best if it is applied to the bridge of the nose as well as the nose itself. UPDATE 2017: I have not needed to use tacro for a number of years now. I manage Mika's dryness with coconut oil and it's never as bad as it was when she was younger. If you can't afford tacro or have a mild case of bengal nose, start with coconut oil! Less expensive and safe to ingest. Hello I believe my f3 jungle bob has this. 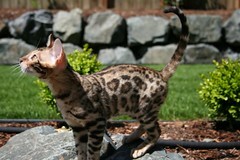 He has Bengal bloodline used in his breeding line. The vet gave him antibtiiic and steroid and it didn't help. When it didn't help he said then must be a virus or fungal. And if virus give l-lysine. And I don't think it's fungal becuse it's not growing allover the face just his nose is shrinking strangely. Like in these pics. Thanku for this article. The ointment is 0.1% tacrolimus. Just as an update, after a couple years of using the treatment, Mika's nose is now a lot better and I don't really need to use the ointment anymore. Now that the condition is under control, a dab of coconut oil on her nose when it is looking dry is usually enough, at least for Mika. Good luck with your kitty! I hope this works for you! 000O0o. (Coconut oil)... yes thanku for that tip will try that. So, does Mika have any other health issues? Give coconut oil a try first if you haven't. I find that it has worked equally well as the tacro for Mika and it doesn't pose any risk to you or your kitty, unlike the tacro. As far as other health issues, Mika has a tendency to over-groom sometimes and some diet sensitivities (hard issues to pinpoint), but otherwise she's a very active, happy cat. Her sister doesn't seem to have any issues at all.